When it comes to leaks, companies try their very best to keep everything locked down and prevent information escaping into the world. 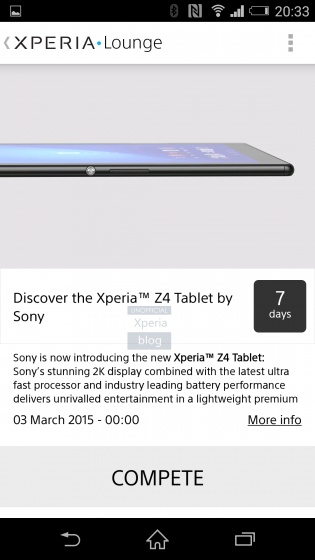 This time one of those companies jumped the gun a bit, because Sony has accidentally revealed a bit of information about the upcoming Xperia Z4 tablet ahead of an official announcement. The tablet was accidentally revealed on Sony’s Xperia Lounge app, offering existing Xperia owners the chance to win one of the tablets for themselves. According to the blurb from the competition page, the Z4 tablet will have a 2K display, along with a faster processor and better battery life. The tablet is likely to have a 10-inch display, and appears to be roughly the same thickness as the Xperia Z3 Tablet Compact. We don’t have much information to go on for the time being, but it’s good to know that this tablet definitely exists. Plus, the chances of it being incorrect at this stage are next to none. That’s because, unlike other rumours, this information is far more reliable since it came directly from Sony. It’s more than likely that we’ll be hearing more about this next week at MWC, presumably before Tuesday the 3rd if the date on the app is anything to go by.